With Custom Design, there is no limit to designing your own piece. At Austin Private Jeweler, I specialize in custom jewelry design and crafting exclusive pieces for my clients. It’s amazing to see the transformation of a client’s heirloom or existing piece of jewelry as it turns into something fresh and modern that fits your style. Many clients also choose to start from scratch and create that truly one-of-a-kind design. No matter the situation, you’ll be involved in each step of the creative process. I will collaborate with you on a custom design suited to your taste and budget. When you hear the words, “Custom Design”, you may think the cost will be at a premium to “off the shelf” pieces, but that is not the case. There is no middleman since I go directly to the casting and gem suppliers to create your unique piece - ultimately passing the savings on to my client. We sit down together and watch your design unfold before your eyes. 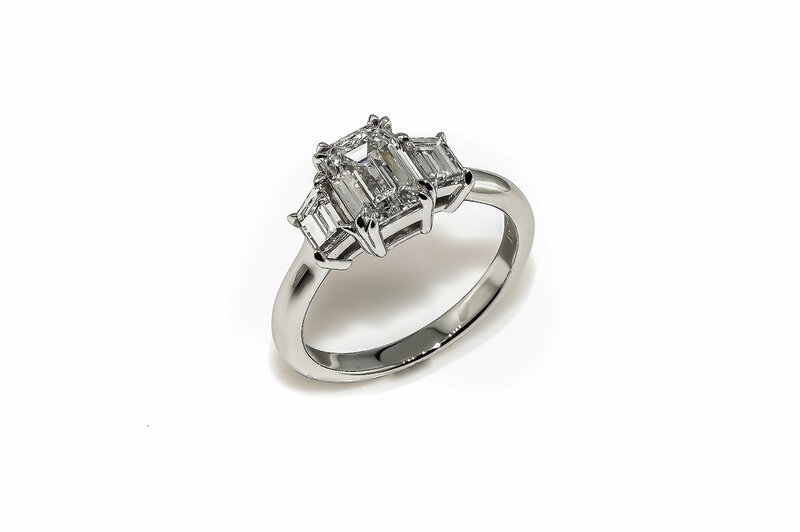 We’ll start with a private consultation where we look at photos or actual pieces to begin the creative process. Then we will select your perfect stone and metal choice, utilize computer programs to watch it all come together. Once we complete the look of your custom piece and finalize the rendering, then the real fun begins! Going through the custom design process is one of the most rewarding experiences as a jeweler and seeing the client’s delight at the end makes it all worthwhile. With custom design - the possibilities are truly endless!